When I was walking along one of the many two track roads in the Manistee National Forest I was spooked by a rustling in the trees. Turned out to be a deer! I’m sure he was more nervous than I was since he was all alone and not accompanied by two pooches! This entry was posted in A pastel a day, Daily painting, ebay sales, Landscape, painting a day, Pastels, path, road, Woods scape and tagged art for sale, forest, manistee national forest, pastel painting, path, road, trees, woods on February 14, 2019 by Marie Marfia. This is from a wonderful walk along the dunes at the Ludington State Park which is just a half hour from where I live in Michigan. I love to come here in the winter time in the evening when the clouds and the dunes are lit from the low sun. It’s just gorgeous here. This entry was posted in A pastel a day, beach, ebay sales, Landscape, painting a day, Pastels, path, seascape and tagged dunes, pastel painting, path, seascape, snow, winter on February 13, 2019 by Marie Marfia. Titmouse, 6×9″ pastel drawing of a bird on a branch by Marie Marfia ©2019. This drawing is available on eBay. Click the link below for more info. If it’s too cold to venture out into the woods with my dogs I am happy to watch the birds at the feeder outside my glass sliders. They puff themselves up in the cold and feast on sunflower seeds. My husband calls it Bird TV and it never gets old. 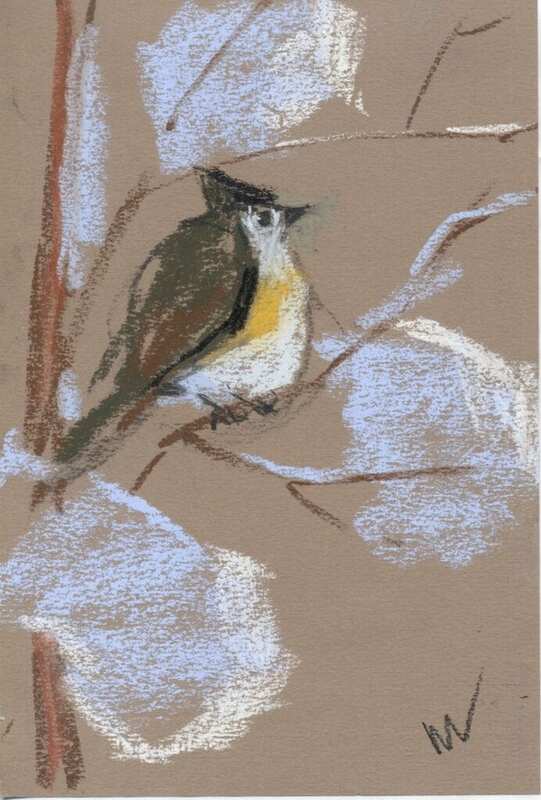 This entry was posted in A pastel a day, bird, Daily painting, ebay sales, painting a day, Pastels and tagged art for sale, bird, pastel painting, titmouse on February 11, 2019 by Marie Marfia. On the Bank, 5×7″ pastel painting of a bend in the Pere Marquette Riveer in the Manistee National Forest by Marie Marfia ©2019. This painting is available on eBay. Click the link below. I love this bend in the river. I stand on the bank and look down on the water flowing by. It’s very peaceful and makes me grateful to live where I do. This entry was posted in A pastel a day, Daily painting, ebay sales, forest, painting a day, Pastels, river, Woods scape and tagged art for sale, forest, manistee national forest, pastel painting, pere marquette river, river, woods on February 9, 2019 by Marie Marfia. 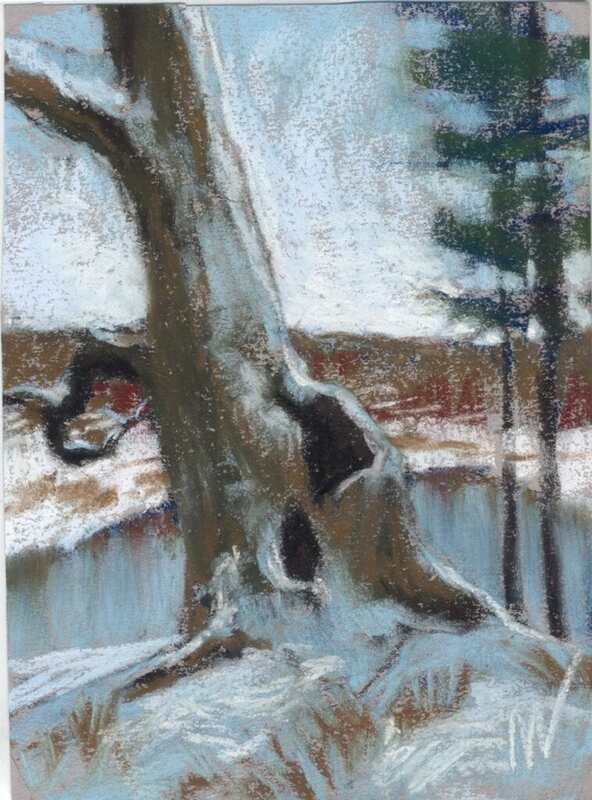 Old Guardian, 6×9″ pastel painting of a tree on the bank of the Pere Marquette River in the Manistee National Forest. This painting is available on ebay, see link below. I love this old tree that sits on a the bank of the Pere Marquette River in the Manistee National Forest. I love the way the left branch spirals out into space, a fractal if I ever saw one. I love the holes in the trunk and like to imagine the critters that take refuge there. 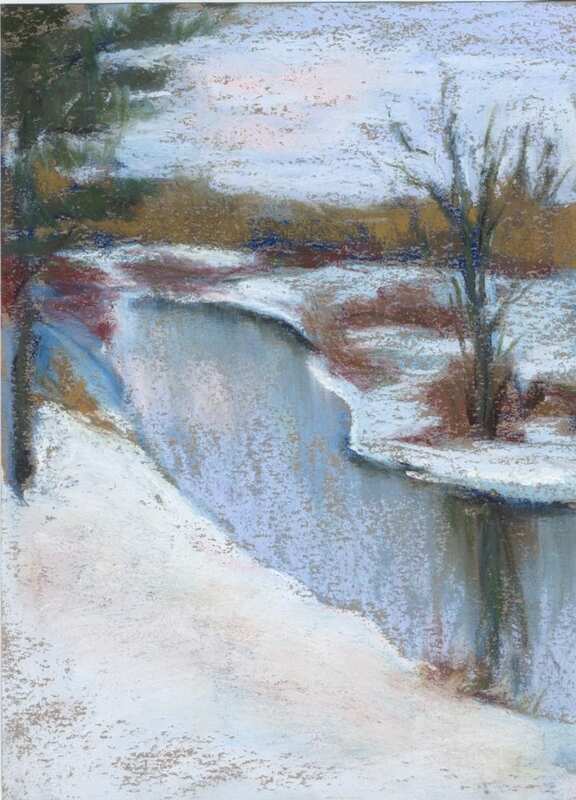 This entry was posted in A pastel a day, Daily painting, ebay sales, Landscape, painting a day, Pastels, river, trees, Woods scape and tagged art for sale, manistee national forest, pastel painting, pere marquette river, river, tree on February 8, 2019 by Marie Marfia. Little Cabin, 5×7″ pastel painting of a snow-covered cabin in the woods by Marie Marfia ©2019. Available on eBay. Even though I was snowed in for a week I still had a view of this pretty little cabin in the woods right outside my window! 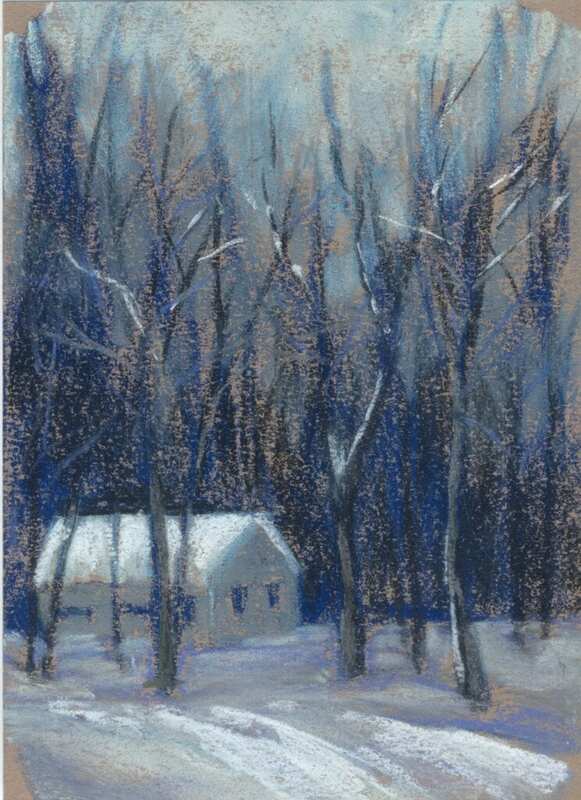 This entry was posted in A pastel a day, Daily painting, ebay sales, Landscape, Manistee National Forest, painting a day, Pastels, Woods scape and tagged cabin, cottage, forest, manistee national forest, pastel painting, snow, winter, winter scene, woods on February 7, 2019 by Marie Marfia. 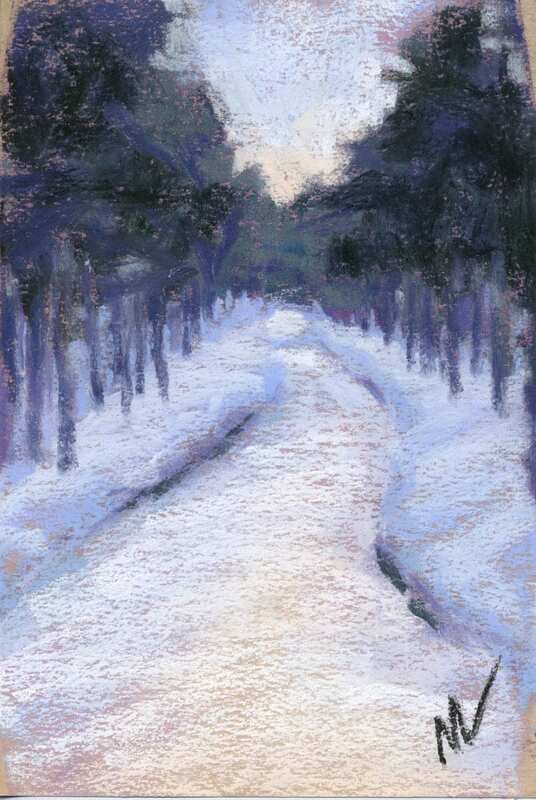 Fresh Snow, 9×6″ pastel painting of a snow covered road through the Manistee National Forest by Marie Marfia. ©2019. This painting is based on a walk down a two-track road in the winter time. There was deep, fresh snow all along the two-track road and a pale blush of peach just over the trees on the horizon. I love walking in the Manistee National Forest with my dogs. It inspires my work. 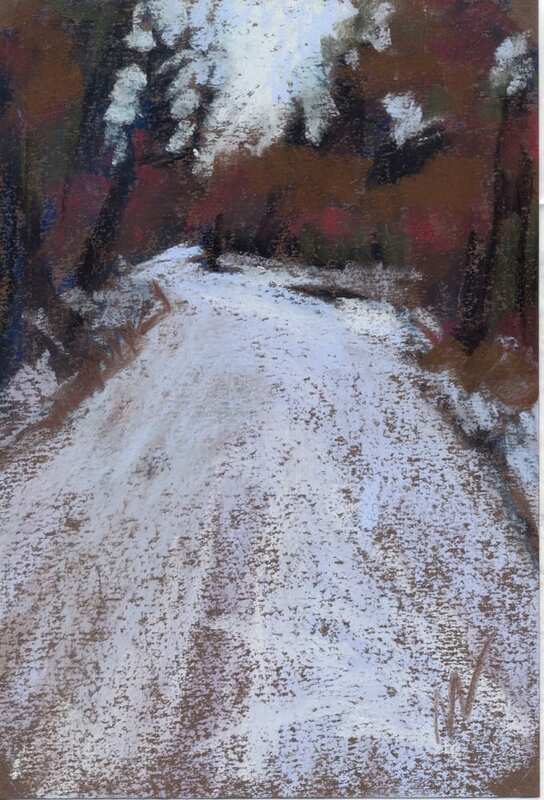 This entry was posted in A pastel a day, Daily painting, ebay sales, forest, Landscape, painting a day, Pastels, path, Woods scape and tagged forest, manistee national forest, Marie Marfia, pastel painting, path, road, snow, winter scene, woods on February 4, 2019 by Marie Marfia. This painting is based on a walk down a two-track road in the winter time. The little bit of snow on the ground was mixed with lots of oak leaves and I could see the sun coming up over the horizon and throwing beautiful blue shadows everywhere. I love walking the woods in the morning with my dogs. It inspires my work. This entry was posted in A pastel a day, ebay sales, forest, Landscape, Manistee National Forest, painting a day, Pastels, Woods scape and tagged art for sale, manistee national forest, Marie Marfia, painting, pastel, pastel painting, sunrise, woods on February 1, 2019 by Marie Marfia. This painting is based on a walk down a two-track road in the winter time. I like how the road curves out of sight up ahead and the drama in the horizon line. This was a very fun painting to do. I love walking in the Manistee National Forest with my dogs every morning. It inspires my work. 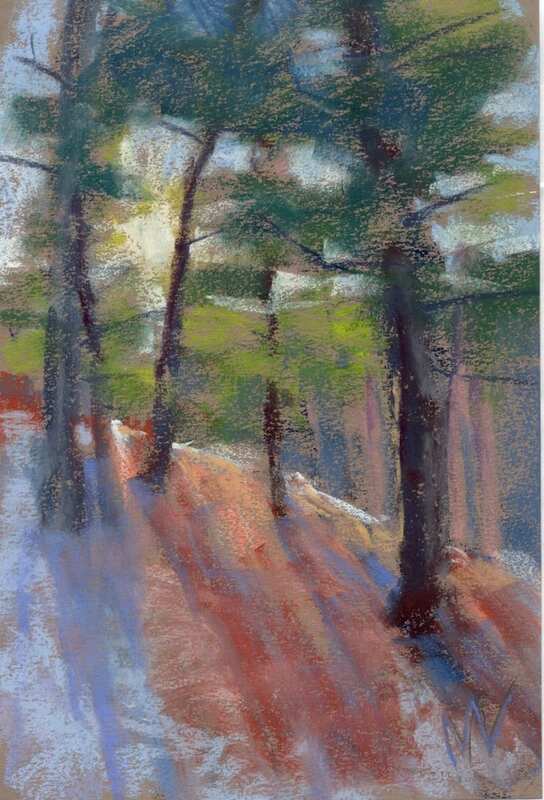 This entry was posted in A pastel a day, Daily painting, ebay sales, forest, Landscape, Manistee National Forest, painting a day, Pastels, road, Uncategorized, Woods scape and tagged art for sale, forest, manistee national forest, Marie Marfia, pastel painting, path, road, woods on January 31, 2019 by Marie Marfia.